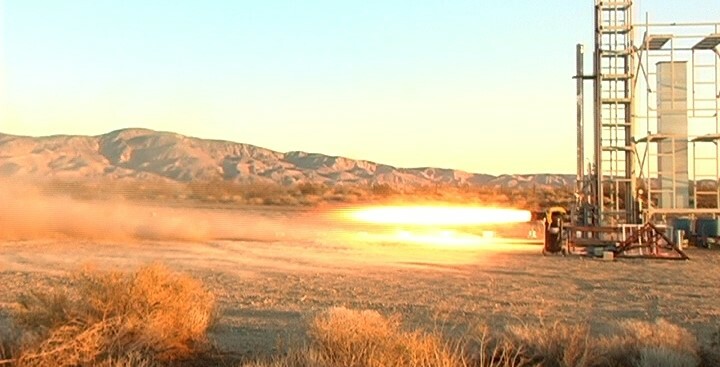 A short-duration engine burn at Interorbital Systems' test facility today qualified their engine in preparation for the company's upcoming sounding launch. An incandescent 24-foot beam of fire thundered from the engine’s ablative combustion chamber, generating 7,500-lbs of thrust. The engine performed nominally, and will be used on the launch of IOS' Common Propulsion Module Test Vehicle (CPM TV). The test also verified several new IOS software systems, including automated launch control and launch system health reporting. Combustion stability of the engine's secondary hypergolic liquid ignition propellant was also confirmed in an extended burn phase. Data collected during the test showed a smooth transition from the secondary hypergolic fuel to the primary propellants with a corresponding increase in thrust, as expected. Inspection of the engine's combustion chamber after the firing revealed only slight ablation, despite exposure to temperatures over 2,900 degrees Celsius. The rocket engine's unique injector and combustion chamber architecture yielded a specific impulse (Isp) averaging 245 seconds at STP or 305 seconds in vacuum. The high density of the propellants, concentrated white fuming nitric acid and turpentine, produced a density specific impulse at sea level of 323 seconds. High density specific impulse substantially reduces the weight of a rocket's propellant tanks and increases the rocket's payload lift capabilities. The overall performance of IOS' propulsion system is equal to the performance of more conventional liquid oxygen (LOX) and kerosene engines. However, IOS' system avoids complex logistical problems associated with LOX, which must be stored at cryogenic temperatures. The nitric acid oxidizer used by IOS can be stored in a standard storage tank for several years without refrigeration. This engine test completes the readiness checks of all systems required for the upcoming low-altitude launch of the CPM TV. The CPM TV will carry a mixed manifest of four payloads including 2 CubeSats and 2 TubeSats. All satellites aboard the first suborbital launch are constructed from IOS' line of small satellite kits.